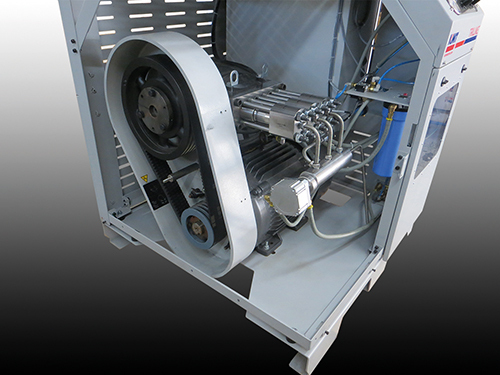 With the direct-drive high pressure pump TRILINE TL-I 30, KMT Waterjet Systems broadens their product range by adding an alternative pump technology to their portfolio. The new pump has an excellent cost of ownership value and can be used as a stand-alone unit for everyday cutting needs. 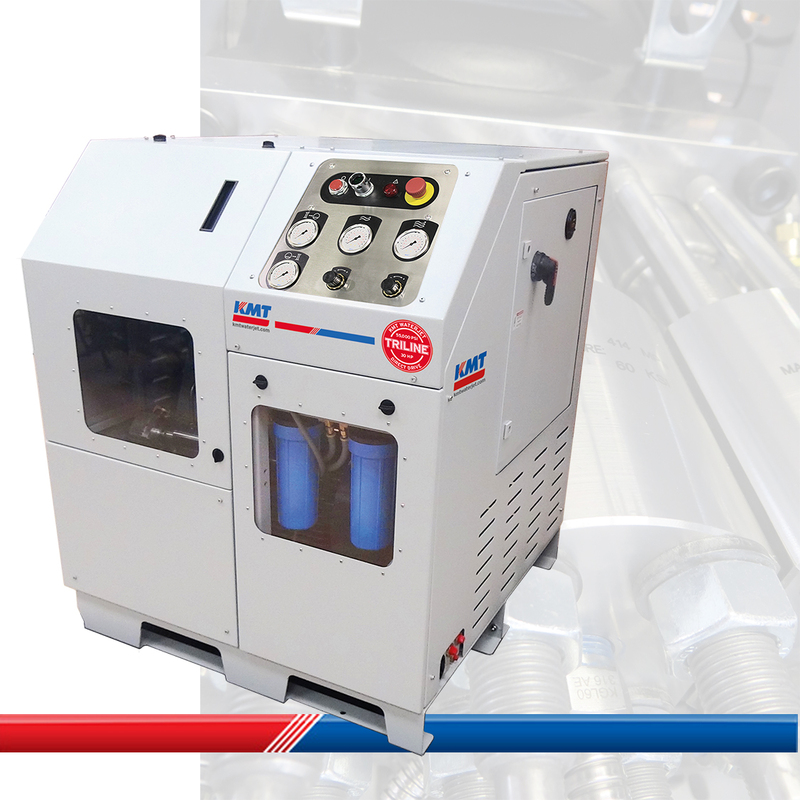 The direct-drive technology for high pressure pumps has been developed in the 1990s and constitutes an alternative to hydraulic intensifier pumps when it comes to waterjet cutting machines. Direct-drive pumps are based on a comparably simple technology with the power being transmitted from the motor to the topworks via a belt and pulley drive system. This design makes direct-drive pumps more efficient than intensifier pumps and allows for a smaller footprint of the machine. An electric motor directly powers three crankshaft-driven plungers via an easily manitainable belt and pulley drive system. The plungers are operated with a phase-shift thus delivering a constant stream of high pressure water. Due to this direct power transmission, a direct-drive pump has a relatively high efficiency of up to 85%. Moreover, this method of power transmission is very simple and consists of far fewer parts than a hydraulic circuit. Operators of direct-drive pumps therefore benefit from an easy troubleshooting when it comes to the drive system. In comparison to hydraulically driven systems, belt-and-pulley systems are quieter and cleaner.